Fruit is delicious all year round, but there’s nothing like the sweet and fresh taste of an in-season piece. If you’re asking yourself, “What does in season mean?”, know that during a large part of the year, produce is artificially grown and shipped to your grocery store from different countries, which can really affect the quality and taste of what you buy. Fruits and veggies only have a relatively small period of time where they are able to grow naturally and fully, and what time works best is based on the different kinds of fruit groups. When in season, our produce tastes flavorful, retains more nutrients and even costs less! And now that winter is over, there’s a whole fresh set of spring fruits that are ripe for the taking. 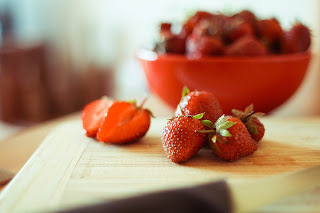 To give you an idea of what’s especially delicious right now, here are five in-season fruits that are best until May and some healthy recipes to use them with! The strawberry is arguably one of the best fruits out there because of its sweet taste and simple storage methods. Strawberries are perfect to eat at home or take to work to snack on throughout the day and require minimal cleaning and preparation. They also pair deliciously with smoothies and yogurts, so if you’re looking for something cold and refreshing to enjoy on a warm spring day, try this strawberry lemonade smoothie for a yummy and nutritious breakfast or snack! Honeydew melons often get a bad rap, but that’s because when bought out of season, they have a different taste. During spring months, however, honeydews are full of flavor, taste amazing and have the added bonus of providing a large amount of fiber and potassium. So instead of neglecting honeydews like usual, pick some up at your local farmer’s market and taste the sweetness for yourself. Slice them up and eat them whole, or use them to make these delicious honeydew-lime pops! Most people associate pineapples with summertime, but surprisingly enough, they taste the best during spring! You can eat them fresh, use them to make juice or cook them for a delicious smoky and sweet taste. The best part of pineapples is their diversity, because unlike most fruits, pineapples aren’t just used for smoothies and desserts! They pair excellently with pork and beef and can add a twist to most traditional dinner dishes. With this in mind, try out these healthy pork and pineapple kebabs that are sure to please. 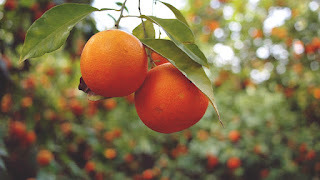 A spring fruit list wouldn’t be complete without mentioning oranges. Oranges are great when used for juice, mixed with other things or eaten plain. They’re also great to buy because they last up to three weeks in the refrigerator, so you can get them without having to worry about eating them in a few days. May is usually the last month when oranges are considered in season, so make sure to grab some before it’s too late! Stock up on them, and use your extra ones for this low-sugar orange sorbet with bittersweet chocolate. With these five spring fruits in your shopping cart, you’ll have no problem eating healthy while enjoying every bite! Eat these fruits alone or in their respective recipes, and if you’re feeling really bold, use the leftover fruit and mix them all together for a tasty fruit salad! Wow, amazing fruits! Its a healthy one. This one is an excellent one.Thanks for sharing.looks good.Thanks for the tip. It was very useful.You made it and they actually turned out well.Happy to read your post and appreciating you for making this better and yummy foods.Thanks a lot.You will get academic integrity, quality and punctuality from sites available now. Hence, each of the paper done at custom essays has a touch of professionalism.It is assessing the information or ideas relevant to the essay topic. You will get better and effective information from the sites available now on web.Refer custom essay writing service for more details.